When you think of snakes you probably picture an exotic jungle somewhere on the other side of the world, fierce creatures that eat all manner of wildlife, or you picture the dry barren desert of the Australian outbreak where snakebites can be a quick way to end your life. What you don’t tend to picture is a back garden somewhere in the English countryside, where a snake might be slithering around your plant pots and troughs hunting insets or harmlessly in your pond feeding on the insects around those pond plants. But British snakes do exist, although you may never be lucky enough – or unlucky, depending on your feelings about snakes – to view one in your life. The problem for the avid British snake hunter is that snakes tend to be very shy, and only tend to attack when they feel threatened. They’ll be hiding around your compost bin or perhaps your gardens a little overgrown? They like a mess not a neat and tidy garden. This is due to British snake numbers being nowhere near as high as the snakes you’ll find in other more exotic locations than a patch of English countryside near a bypass. There are three different types of British snake, but you’ll be hard pressed to come across one and they’re so rare that they’re a protected species under UK law (the Wildlife and Countryside Act 1981), with it being an offence to disturb them in some cases, so certainly do not put them in the same bracket as pests! In fact saying that, they are the perfect solution to natural rodent control. They will happily gobble up all those nasty critters for you. None of the three types of snakes are particularly dangerous, although The Adder is venomous (further details below), but the recommendation is to avoid touching them(obviously). 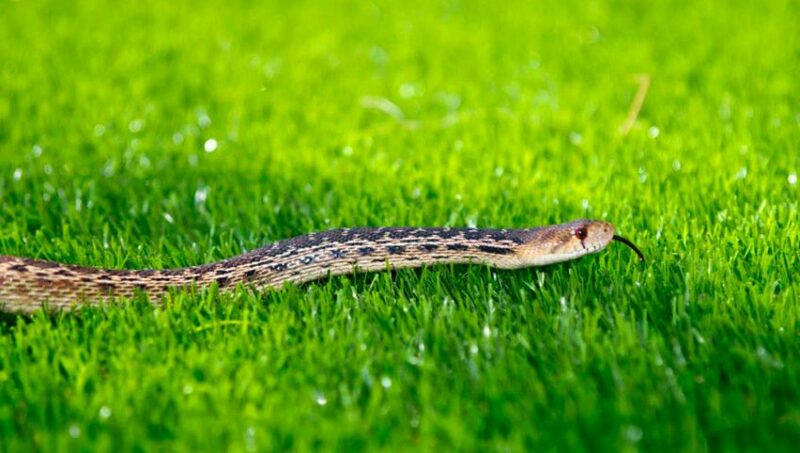 It’s likely, although rare, that the snake could be an exotic pet snake that has somehow escaped its owner, so you can never be too sure. The largest of the three, the grass snake can reach up to 150cm but will usually be measured at about 75cm). Identifying marks are a shade of olive-green, often with a yellow and black collar behind its head and black markings down the side of its slim body. Grass snakes are found in southern areas of Britain and can be spotted around water (ponds, lakes and slow running rivers) due to its diet of frogs and toads. They will also act as your perfect slug control gobbling them (and snails) if you’re lucky enough to get one in your garden. That’s ultra handy since the EU say coffee is illegal as a pest control measure for slugs! It will hibernate from October to March or April, so if you don’t want to catch a glimpse of one your best bet is during the summer. Like many snakes though they’re pretty shy, and will slither away if they feel the vibrations of something approaching – especially a heavy footed human being! However, if you do happen to come in contact with one they have no venom so pose no real threat to humans. They can also be found within gardens around compost heaps, especially if a pond is nearby. Here they will hibernate and lay between 10 and 40 eggs in the spring. The removal of these areas of the garden, plus the continuing clearance of woodland and wild grassy areas, are unfortunately contributing to the drastic decline of the grass snake numbers; so count yourself lucky if you do spot one and leave them well alone, don’t move them, not even with gloves! We need to take better care of wildlife in our garden, drought or otherwise. 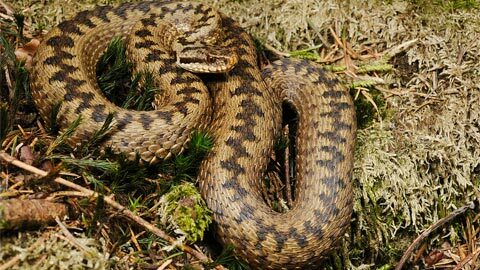 The Adder grows up to around 65cm long, and can be identified by a dark zig-zag marking along the back and a dark ‘V’ on the head. Males also have a light grey background colour, with females having a brown background colour. They are the only venomous snake in the UK, although they have only killed 10 people within the last 100 years and only those that are susceptible to anaphylactic shock are in the most danger. I would say this is something you can rule out when considering the safety of your garden for a toddler. You would have to be unbelievably unlucky for this to become an issue. They will very rarely attack anyway, but to be safe stay well away if you spot an Adder, do not handle with any amount of safety clothing, you should call a professional. This isn’t something that’ll go away with a standard first aid kit either. They can be found throughout the UK as they’re pretty good at surviving harsh conditions. Much like Grass Snakes though they will hibernate between October and spring. They can be found around moors and grassland, and since the ground is more open here you’re more likely to spot an Adder slithering about. Again, try to avoid them if you do spot one as you don’t want a nasty bite! Adders will eat small mammals such as mice and voles; but they’ll also chomp on eggs, birds, frogs and other things as part of a fairly varied diet. Thankfully the snake is not currently under threat, although its numbers have declined in certain areas due to human expansion. Smooth snakes tend to grow up to 70cm long, sporting a grey/brown with dark spots on the back. You will also find a dark butterfly-wing shape around the top of its head. 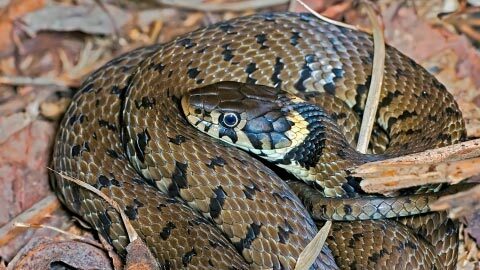 It’s also the rarest British snake, with an estimated population of 3,500 snakes in the Southern Counties of England. During the months between October and spring the smooth snake will hibernate, popping out to mate and give birth to 5-15 young during the warmer months. They are much like us, we have plenty to do in the garden until November as we are preparing for spring but then we almost hibernate for a few months too, just staring at our garden through the conservatory. They normally feed on lizards and other small reptiles, plus other snakes (including grass snakes). They can also follow the adders diet of small mammals, grabbing their prey and squeezing much like a constrictor would. Isn’t the slow worm a snake? There is one other creature you may see slithering about; the slow worm. Although the slow worm may have the appearance of a snake it is, in actual fact, a legless lizard. They used to be common in UK gardens (eating pesky slugs and snails), but their numbers have decreased to the point where they have been granted protected status; making it illegal to intentionally kill, injure or sell slow worms. The fact that they have no defences against domestic cats, who are a common sight around UK gardens, may have contributed towards their decline. 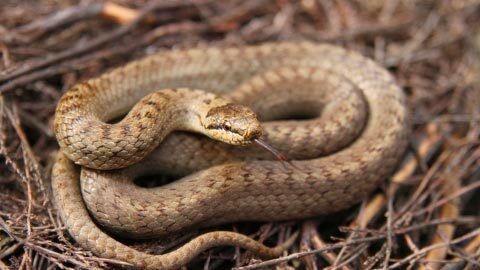 So, British snakes aren’t the most common thing you’ll spot on our beautiful island, but knowing the signs is key to finding them if you wish to have a glimpse or simply identifying them if you happen to find one slinking around your garden.